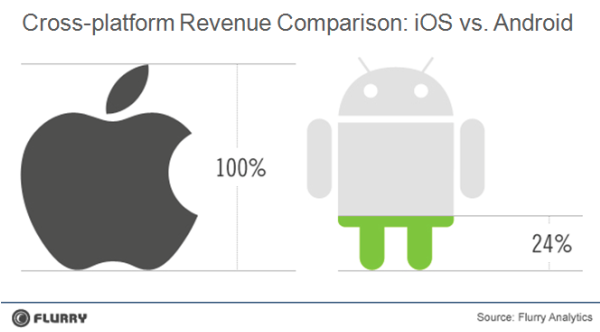 A new analysis of several top apps with both iOS and Android versions reveals that every $1.00 generated on iOS by an app corresponds to $0.24 in revenue for the Android version. Analytics firm Flurry Analytics culled through its data in a report on Tuesday (via Daring Fireball) to examine Google Chairman Eric Schmidt's recent claim that app developers will prioritize Android over iOS in 6 months time. According to the firm's data, the Android's share of new project starts has actually declined in 2011, a fact likely related to Flurry's finding that iOS apps tend to make significantly more money than their Android counterparts. 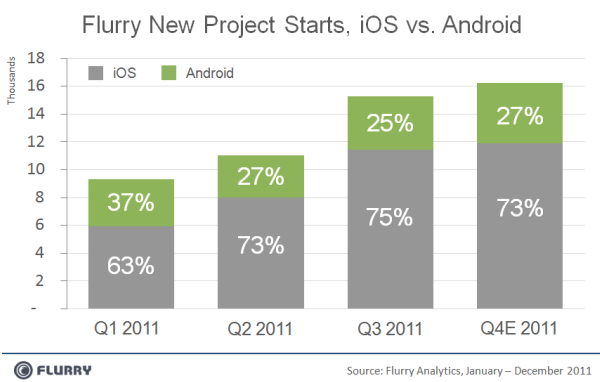 In the first quarter of 2011, new projects within Flurry's network were split 63 percent iOS, 37 percent Android. Android's share dropped to 27 percent in the second quarter and then fell again to 25 percent in the third quarter. The firm estimates that the Android platform will regain some momentum in the fourth quarter, projecting new 27 percent of new project starts to come from Android during the period. With anticipation of the upcoming holiday season, as well as new hardware and software releases from both Apple and Google, developer interest for both platforms jumped up significantly in the third quarter. Flurry, which estimates that its analytics services power 25 percent of all apps on the App Store and Android Market combined, saw new projects jump from roughly 11,000 in the second quarter to 15,000 in the third quarter. After noting diminished developer interest in Android, the firm then set out to test anecdotal reports from developers that they were making three to four times as much money on iOS as Android. "To be sure, we pulled a sample of in-app purchase data from a set of top apps with versions on both iOS and Android, comprising of several million daily active users (DAUs)," the report noted. "Running the numbers, we find that, on average, for every $1.00 generated on iOS, the same app will generate $0.24 on Android." Flurry viewed the largest single factor affecting developer support to be "the consumer's ability to pay." Within Apple's ecosystem, iOS device users must associate a credit card or gift card with their iTunes accounts when setting up a device. Android, however, doesn't have that requirement, resulting in less of its users being readily paying customers. "Despite installed base numbers and daily activations, the almighty dollar still drives business decision making among application developers," the report concluded. "And with the critical holiday season upon us, developers are betting on iOS for Christmas 2011." The revenue difference between Android and iOS apps has been a common theme among results from research and analytics firms. In September, one firm suggested that Apple will generate $2.86 billion in app revenue in 2016, compared to projections of just $1.5 billion for Android. That's in spite of the fact that the study expected Android app downloads to almost double downloads on Apple's platform in five years. Google recently announced that the Android Market had surpassed 10 billion downloads, compared to Apple's October revelation of 18 billion total App Store downloads. Another study from September concluded that "Android developers make much less money from paid apps than iPhone developers do," citing piracy as an issue for Google's platform. Over 50 percent of Android developers reported that piracy was a problem for them, according to the Yankee Group. Piper Jaffray analyst Gene Munster said last month that iOS appears to have taken in 90 percent of all dollars spent on mobile devices, compared to Google's 7 percent of gross revenue. Over the next three-four years, Munster sees Apple maintaining a dominant 70%+ share of mobile app dollars. He went on to estimate that 13.5 percent of App Store downloads are paid, compared to 1.3 percent of Android Market transactions.